The TC5 Wiss 4 5/8'' Industrial Thread Nippers, Blunt Points is one of thousands of quality tooling products available from MRO Tools. 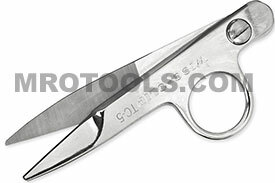 Please browse Wiss Scissors and Shears for tools similar to the TC5 Wiss 4 5/8'' Industrial Thread Nippers, Blunt Points. TC5 Wiss 4 5/8'' Industrial Thread Nippers, Blunt Points description summary: Wiss 4 5/8'' industrial thread nippers, blunt points feature a self-opening spring-action assures fast, effortless cutting. Wiss thread nippers are made of quality fully nickel-plated hot drop-forged cutlery steel. Quantity discounts may be available for the TC5 Wiss 4 5/8'' Industrial Thread Nippers, Blunt Points. Please contact MRO Tools for details.